It's a Project 365 double feature! (If you're not familiar with this project, see Project 365: Week 1 for some background on it and our personal goals for the year). I'm laughing as I write this post, since - in terms of taking pictures - we're currently on week 11 of this project, and I've only uploaded images through week 7. When we started, I thought that I'd be great with keeping up with the task of getting the photographs up on Flickr and here on Bubby & Bean, but would struggle with taking a picture a day. It turns out that taking a new photo everyday is incredibly easy, but finding the extra 30 seconds to upload a photo after it's taken seems to be the most difficult task in the world for me. That said, I'm crossing my fingers that once the fiance gets back from the band's winter tour next week and is able to help out with housework, Bubby (old dogs are work! ), wedding plans, etc., I can get caught up. And if I can't, that's okay (looking at this as I type!). 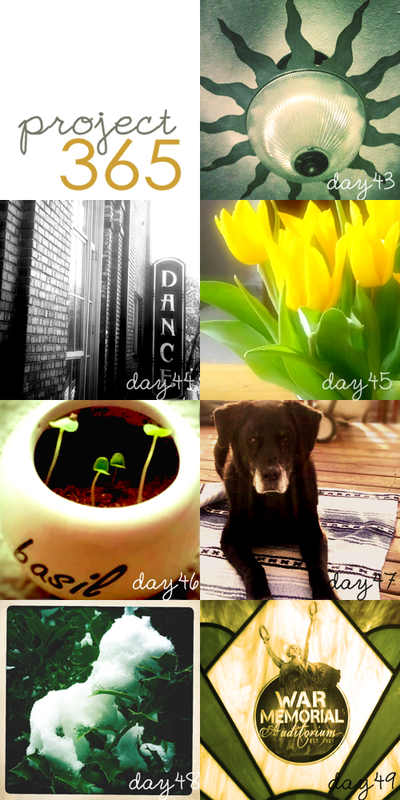 The collections here, from weeks 6 and 7, showcase a lot of random goodness: a visit from my friends from Colorado with their beautiful children, some pretty yellow tulips my mom brought me as a reminder that spring was around the corner, Bubby enjoying one of the first sunny days we've had in Chicago this year, and lots of shots that Robbie has emailed me from road. 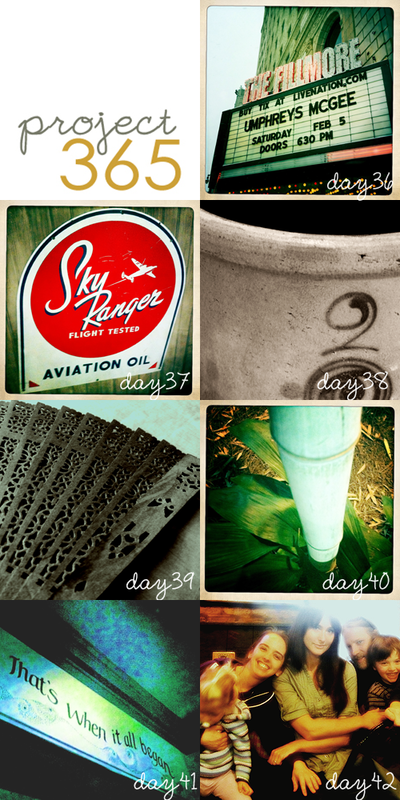 For those of you doing Project 365 or similar photo-journaling projects, how are you doing so far? Do you find it easier to take the photographs than upload them, or vice versa? P.S. I'll be posting again later about a project that I'm participating in called Bloggers Day of Silence, to raise awareness and acknowledge the devastation that Japan is facing right now. For the first time, there will not be a new post tomorrow on Bubby & Bean. Check back later for more details and an explanation of my involvement, as well as information on the new art print I designed to benefit relief efforts. I have heard lots of talk about project 365 but never really knew what it was all about. Sounds like a lot of fun. I just love all your pictures! Your photos just keep getting better and better! :-) When I tried to do this I fell behind on taking the pics AND uploading them, so I think you're doing great!!! you are a project 365 rockstar!!! i can't wait to see the rest! That's so cool that you're participating in 365! I tried to, but eventually it died out for me :( I did think it was so cool though, to document *something* from every day of the year. Then it doesn't seem like the year just passed by and some days were meaningless. I love your photos, they're awesome! Seeing a photo of The Fillmore put a smile on my face. some great pictures. don't know how you manage to take good ones everyday but somehow you manage it.